In her debut poetry collection Who Is Mary Sue? Sophie Collins problematizes the concept of a “mary sue,” a term used by fan fiction writers and readers to denote an implausible and too flawless character, most often female. A mary sue is frequently perceived as a narcissistic reflection of the writer, often female too, and as a sign of bad writing. 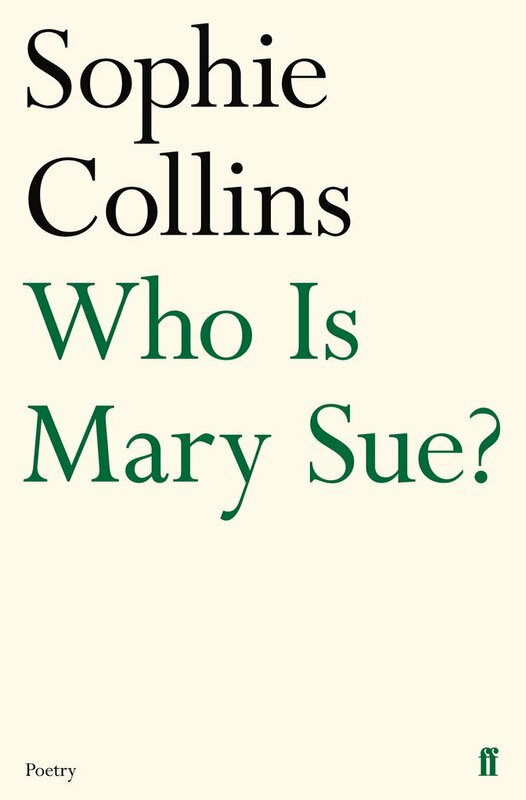 This is the starting point for Collins, and she extends the discussion beyond fan fiction to consider how the deprecation of mary sues is linked to a larger underlying problem where women’s writing (such as literary fiction or poetry) is oftentimes belittled as too autobiographical, or, as Collins puts it, “in literary fiction, when a female writer’s female protagonist is considered up to scratch, she is often taken to be a thinly disguised version of the author’s non-idealised self.” Idealized female selves, on the other hand, are perceived as mary sues. Collins has a valid point, and this eponymous centerpiece of her collection makes it a worthwhile read already. There is a lot more in the collection besides the titular piece, which takes only twenty pages of a total of a hundred or so, yet every poem seems somehow connected to its central argument. For instance, “Healers” takes a scaffold as an analogy between artistic constructions and more literal constructions, where a church “depicting Saint Artemy of Verkola / unusually pious / highly venerated” is temporarily covered by a scaffold which Collins depicts with gendered pronouns: “At first I didn’t notice her / slumped against the side of the church.” It is a particularly vivid metaphor, while some poems leave me more bewildered as to how they relate to the main argument, or to any bigger scheme. Yet even when I am lost, there is usually something to enjoy, such as an occasional sweetly laconic rhyme: “I don’t matter. / I am a blemish, / a fragment, / an apartment.” A huge amount of the lines that comprise Who Is Mary Sue? are, however, collaged from other writers (to play with the idea of fan fiction, I presume), so I am hesitant to quote too much here, not only to avoid giving out too much of the brief collection, but to avoid any copyright infringements. Collins’s decision to blend poetry with essay writing and collages from other writers is ultimately an effective one, although I find it slightly undeveloped at times. Essayistic arguments tend to call for a thorough analysis, which the format utilized here does not allow, yet, perhaps, that is what Collins is deliberately doing here, testing the waters and asking whether we necessarily need long, academic treatises to get points across (which, historically, is a male-dominated sport, which leads us to a whole new bunch of questions, not to be discussed here). Her style is a rather modern take on poetry itself, as it troubles the whole idea of original creation by relying so heavily on previous texts from all sorts of genres, including non-fiction prose (once again, I assume, to play with the notion of fan fiction). It is a challenge Collins tackles elegantly, as even after weeks of finishing her collection, I still find myself thinking about its main tenets. Even if I was looking for a more detailed view on mary sues, Who Is Mary Sue? accomplishes what any piece of rhetoric, be it poetry or essay, often sets out to do: docere, delectare, movere – to teach, to delight, to move.